LAST WEEK I found one of the oldest of fly-fishing questions in a new place. Local guide Brandon Murphy, Ted Leeson, and I were floating the Snake River out of Jackson, Wyoming, on a day when the big river was absurdly high. Some downriver Idaho potato farmers, I was told, needed a shot of irrigation water, which dam-released surge had the fine-spotted cutthroats here hugging bottom and for the most part out of reach. The ever-resourceful Murphy (Yes, he’s Irish.) finally beached the driftboat among the willows and took us on a forced march through the puckerbrush to an extraordinary little spring-creek tributary. Cutthroats, including some very big ones, were hovering over weedbeds in the clear, slow-moving shallows. We sneaked around and slinked and stalked so as not to spook the fish, until finally we stood behind a willow clump that would conceal a caster’s waving arm. A long pitch with a tiny olive dry tied to the requisite fine tippet brought no response. More casts. No responses, but at least the target fish hadn’t spooked. Murphy pulled a #20 olive emerger from a small flybox, a fly tied so sparsely as to be almost a bare hook. He tied it on a tippet strand behind the dry fly to act as a trailer. Then he held up the emerger again. And that is the crux of it. However fussy they might be at times about fly pattern and size, trout don’t seem concerned about the highly visible hook bend and point. Okay, why not? That searching image, as used in short-term feeding on dozens of identical blue-winged olive mayflies, for example, depends on a series of positive matches made by the trout almost simultaneously. Right color. Right size. Right shape. And so on. It does not for the most part depend on negative matches. A hook, something that’s not supposed to be there, would be a negative match. 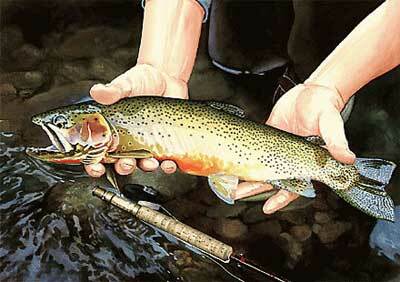 The natural insects on which the trout has rapidly learned to selectively feed don’t have hooks. Hooks are not part of the trout’s developed searching or matching image. Therefore, in grossly oversimplified form, trout don’t care about the hook. There’s actually been quite a bit of technical research on this topic. If you want to search some of it out, start with Neil Ringler’s work at Syracuse University. And if you’d like to argue about the foregoing, post a comment. I’ll reply as time permits. Oh, yeah. I cast again and the big cutty took Murphy’s emerger. I got so excited I broke the fish off. That was that.